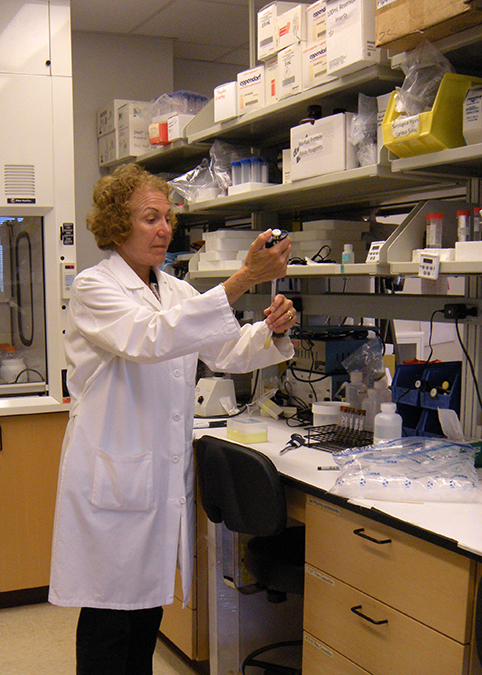 Lynn Wecker, Ph.D. ’72, works in her lab at the University of South Florida Morsani College of Medicine. Sept. 21, 2018 — Pharmacologist, wife, professor, mother, researcher, academic chair. When Lynn Wecker, Ph.D. ’72, reminisces on the many titles she’s held, the discoveries she’s made and the young minds she’s impacted over the last five decades of her career, one emotion rises to the surface: gratitude. In December, Wecker retires from the University of South Florida Morsani College of Medicine, where she has been a faculty member since 1990. The distinguished professor of psychiatry, neurology, neuroscience, molecular pharmacology and physiology and the pre-clinical research director for the USF Ataxia Research Center can trace her career’s start back to New York in the late 1960s. The countercultural revolution was well underway, and Wecker, a chemistry undergraduate student at SUNY Cortland, was curious about the impact of drugs on the brain. “I went to a meeting of the American Chemical Society at the end of my junior year. I filled out a form about my interest in chemical reactions of the nervous system. A couple days later, I received a brochure in the mail from the American Society of Pharmacology and Experimental Therapeutics. That’s when I said, ‘Bingo! This what I want to do: pharmacology,’” she recalls. 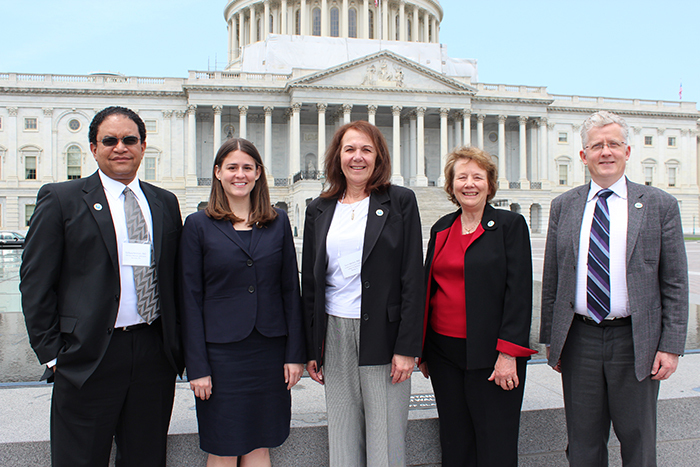 Lynn Wecker, Ph.D., (center) poses in front of Capitol Hill in 2012 with colleagues from Puerto Rico, South Carolina and Florida for the annual Federation of American Societies for Experimental Biology Capitol Hill Day, during which FASEB members meet with Congress to advocate for NIH funding. Wecker’s passion for pharmacology brought her to the UF College of Medicine, where she entered the graduate program in 1969. Here, she found mentors in faculty members like Thomas Maren, M.D., whose research led to the development of a top-selling drug for glaucoma, and Thomas Muther, Ph.D., a Swiss researcher who specialized in drug-induced teratology. From George C.Y. Chiou, Ph.D., Wecker received a piece of advice she continues to impart to her own students. “I’ll never forget, after I defended my dissertation, Dr. Chiou told me, ‘Remember to remain humble. Don’t criticize anyone else’s work unless you have done it yourself.’ That’s something I tell my students today,” Wecker says. Though her mentors vary in their research interests and specialties, they hold one thing in common: they’re all men. As a graduate student at the UF College of Medicine in the early 1970s, Wecker found herself to be one of the few women in her department. She says she didn’t experience much gender discrimination as a student, but after graduating and becoming the third female academic chair of a pharmacology department in the country at USF in 1991, the gender inequalities in her field became strikingly apparent. Though she didn’t have any female mentors of her own during her education, Wecker made a point to network with other women in her field. Today, she proudly serves as a mentor to other women, some of whom have gone on to become chairs and deans in academic medicine, as well as her daughter, Sarah Tigue, and her niece, Amy Wecker. Wecker catches up with former classmate Steven DeKosky, M.D. 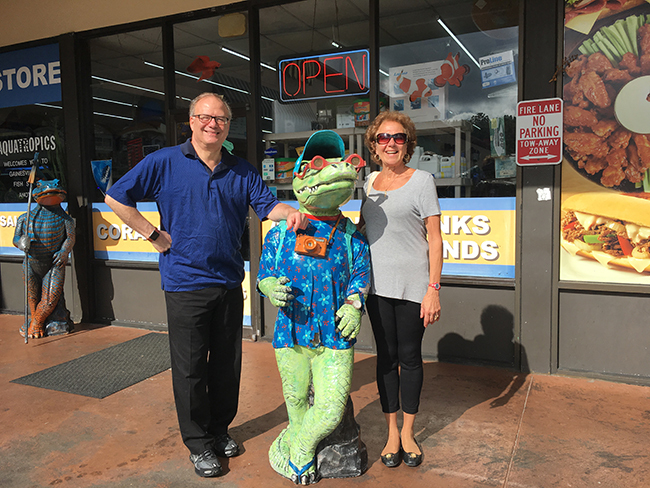 ’74, in Gainesville in August 2017. Wecker may be retiring from her academic post in a couple months, but that doesn’t mean she will cease to be a voice for equality and inclusion in her field. In 2014, she received her copy of the peer-reviewed journal Academic Medicine and balked at the cover art, a drawing that portrayed an all-male medical student body crowded around a standardized patient. Her letter to the editor of Academic Medicine titled “Where Are The Women?” was published in 2015.